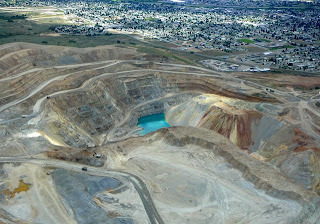 I understand the concept of civic pride -- the fine citizens of Butte, Montana, for example, fiercely defend their burg despite having the largest truck-operated open pit copper mine in the United States expand to become, literally, their very own back yard. To make matters worse, the unsightly mine is now abandoned and it contains highly acidic water laced with toxic heavy metals. But hard-core Butte residents wouldn't live anywhere else and, to their credit they never, ever attempt to sugar-coat the situation by saying something patently false or misleading. It is obvious that the Berkley Pit at sunset isn't as beautiful as Monument Valley or the Grand Canyon and the Butte Chamber of Commerce avoids such ridiculous claims, tempting as they might be. Too bad this isn't true in my very own backyard. "A majestic wonderland, blessed with rolling ranges of countless peaks and valleys." Wonderland? Countless peaks and valleys? Sounds a lot like Switzerland or Austria or New Zealand. To continue this imbecilic illusion is nothing short of being pestiferous. I'm guessing that whoever is responsible for this pamphlet's pathetically perpetual, pompous, pervasive, perturbing and pertinacious portrayal must be a certifiable pinhead. NEWS FLASH -- the renowned investigative team at Needtovent, headed by internationally-revered Hans Blix, has just discovered the identity of the Bulverde/Spring Branch Chamber of Commerce employee responsible for this absurd, moronic beschreibung. Luckily our very own Daniel Wells, erstwhile staff photographer for the New Braunfels High School UNICORN, was nearby and thus able to take this snapshot of the bedazzling Bulverde-born and bred beauty during her lunch break. Is that a Comal County Sheriff's cruiser coming up my driveway?